Before founding Hilo Coffee Mill on the Big Island five years, ago, Katherine Patton and Jeanette Baysa knew nothing about coffee other than that they loved to drink it. When: Meet between 8 a.m. and 4 p.m. Mondays to Fridays. No appointment is necessary for parties numbering less than 10. Weekends tours arranged by appointment. 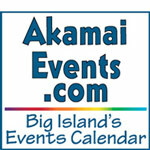 Notes: Gift items, accessories and coffee can be purchased on Hilo Coffee Mill's Web site. Coffees are roasted to order, packed and shipped within three days. Notes Katherine Patton, "Coffee is like fine wine. It needs time to breathe and age. The best time to drink your freshly roasted coffee is three days to one month after roasting." The coffee also can be purchased at more than a dozen stores, inns and restaurants on the Big Island, including KTA Supermarkets, Cost-U-Less, Puna Fresh Foods, Hale Kai Bed & Breakfast, Kope Kope Espresso Café, and Seaside Restaurant and Aqua Farm. Longtime friends who had met while working as managers for Bank of America in Honolulu, they were the proprietors of Kope Kope Espresso Café in Hilo. "It was the only way we could get a quality cup of coffee," recalls Patton, Hilo Coffee Mill's president. "We would always be approached by farmers who wanted us to sell their coffee." Both agreed that doing so would be a good show of support for community businesses, but after conducting numerous taste tests they were disappointed by the lack of consistent quality among the products. "We decided to create another business that would mitigate the consistency issue, afford us the ability to create our own blends and special roasts, and roast coffee not only for our cafe, but for other fine restaurants," Patton said. While building a home in Mountain View, they hired Steve and Kristy Hill to do the tile work. Meeting them proved to be serendipitous; they discovered the Hills owned a 12-acre coffee farm in the area. "With Jeanette and I having the business background and Kristy and Steve having the farming background, it was a perfect match for the start-up of Hilo Coffee Mill," Patton said. "When the idea became serious, we asked for their input, and they became involved as co-founders of the business. Even though Jeanette and I manage daily operations, they're still valuable resources for us. In fact, Kristy works three days a week as our primary roast master." 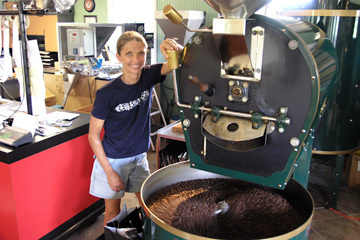 Chief roaster and Hilo Coffee Mill co-founder Kristy Hill with freshly roasted East Hawaii coffee beans. HILO COFFEE MILL began as a processor and wholesaler. In October 2004, Patton and Baysa sold Kope Kope Espresso Café so they could concentrate on the new business. 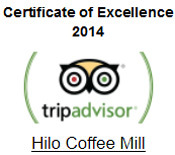 Today, Hilo Coffee Mill is East Hawaii's largest certified coffee mill. Say "coffee," though, and the first thing most kamaaina still think of is Kona on the Big Island's west side. Few people know that in the late 1800s, 6,000 acres of coffee flourished in the fertile eastern rain forest regions of Hamakua, Puna and Kau. Farmers gave up coffee production there at the turn of the last century, when sugar cane proved to be more profitable. In the mid-1990s, after the last of the Big Island's sugar plantations closed, East Hawaii farmers looked to coffee as a viable replacement. Hilo Coffee Mill is now leading the area's coffee renaissance. The company grows coffee on five of its 24 acres in Mountain View and helps about 40 small farms (ranging from one to 15 acres in size) process, roast, package and market their products. "To ensure a quality crop, we advise them on the varieties of coffee to plant, the fertilizers that are best at different stages of growth and the proper methods to use should they decide to process some of their crop," says Patton. "All of our coffee is pesticide-free, and the crops of all of the farmers we work with also are pesticide-free." The mill opened its new 3,000-square-foot plantation-style headquarters in October. Located off Highway 11 midway between Hilo and Hawaii Volcanoes National Park, it includes milling, roasting and packaging facilities; offices; a retail store; and the Latte Da Bar at the Mill, which offers a menu of lattes, mochas, cappuccinos, hot chocolates and fresh brewed coffees and teas. On a complimentary hour-long tour, visitors can learn about the coffee production process, from cultivating the trees, pulping (taking the fruit off the beans) and fermenting (taking the mucilage off the beans) to drying, hulling and roasting the beans. "We also show them how the coffee is flavored, ground, packaged and brewed," says Patton. "We conclude the tour with free samples in the Latte Da Bar." She describes the flavor of East Hawaii coffee as "nonacidic and smooth yet maintaining a bold, full-bodied, robust edge. "Many people have said they can drink it black because it's not bitter. Our slogan is 'Paradise in Your Cup.'" 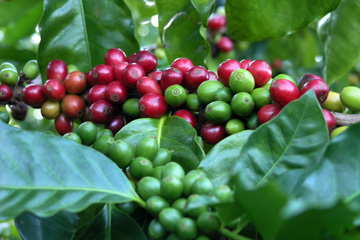 Coffee cherries ripen before harvesting. Patton and Baysa often conduct the tour themselves. "We tailor it to the interests of the participants," says Patton. "We share tidbits about coffee; for example, we throw away the fruit of coffee and eat its seeds. With every other fruit, we eat the fruit and throw away the seeds." The tour also includes a bit of history about sleepy Mountain View, which, according to Patton, was a thriving town from 1900 to 1942, complete with a theater, grocery stores, meat market, gas station, barber shop, bakery, tailor, blacksmith, shoemaker, pool hall and even tofu and pickle factories. A nine-hole golf course was a popular diversion in Mountain View for 14 years. After Pearl Harbor was bombed on Dec. 7, 1941, however, the course was covered so enemy aircraft couldn't use its fairways as landing strips. These days, Hilo Coffee Mill is Mountain View's biggest attraction. It currently is processing 2,000 pounds of coffee per month, an amount Patton estimates will quadruple in October, when brand-new pulping and drying stations will be fully operational. She's also excited about Hilo Coffee Mill 100 percent Kau Coffee Ice Cream, which was just introduced by manufacturer Hilo Homemade Ice Cream. One of the Latte Da Bar's specialties is Black Eye, a generous scoop of this rich ice cream that's indented at the top to hold a shot of hot espresso. Hilo Coffee Mill also is selling chocolate-covered espresso beans and handmade soaps scented with its roasted coffee. "Coffee is a natural deodorizer," Patton said. "The soap is great in the kitchen for removing fish, onion, garlic and other strong odors." She and Baysa are constantly experimenting with coffee blends to add to the list of perennial Hilo Coffee Mill favorites such as Puna Punch and Big Island Buzz. Every sip is proof of their commitment to "unparalleled quality, freshness and consistency," Patton says. "Paradise in your cup!"